For years, 6mm short throw machines were the only orbital polishers available - but then along came something with a much larger polishing footprint. Suddenly, 15mm or even 21mm became the norm. The longer throw means a larger area polished with each revolution of the pad, saving time, and it gives you a safer, lower temperature cut. Some say 21mm (or more) takes things a bit too far. Because the side effect of a longer throw can be more vibration, slower cut, trickier polishing up to creases and swage lines in bodywork and more chance of pigtails. The clever people at Dodo Juice think 15mm is the way to go. The DAS-15 may be following in large footsteps but it offers excellent performance for the money. 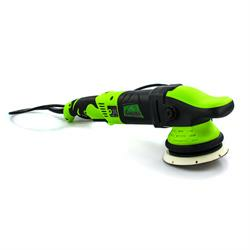 Use it with microfibre pads and Lime Prime Plus for heavier cutting, Red waffle pads and Lime Prime for gentler work.